Donald Trump’s victory in the Electoral Colleges despite Hillary Clinton winning a majority of the popular vote has focused new attention on the Constitution’s procedures for electing the President. Democrats would like the presidency to go to whoever wins the popular vote nationally, while Republicans defend the existing constitutional Electoral College system. However, our current status quo is not how the Framers intended the Electoral College system to work. The Electoral Colleges were supposed to be independent deliberative bodies, not pointless rubber stamps where the winner of a mere plurality in a state takes all of that state’s electoral votes. This winner-takes-all system violates the Framers’ intent and results in presidential elections being decided in a few ‘swing’ states (the six states of the title above) while the votes of tens of millions of Americans are rendered meaningless because they live in a state dominated by another political party. Yet direct popular election is not a good solution, as it risks favoring sectional candidates who would drive our divided and diverse Nation even farther apart. Moreover, the problems of our election system do not end with the winner-takes-all corruption of the Electoral College system. In order to implement the three-fifths compromise, where slaves counted as three-fifths of a person for purposes of allocating seats in the House and Electoral College votes, the Constitution bases those allocations on the gross population, not the citizen population. This has resulted in a significant skewing of political power in favor of areas with large non-citizen immigrant populations. 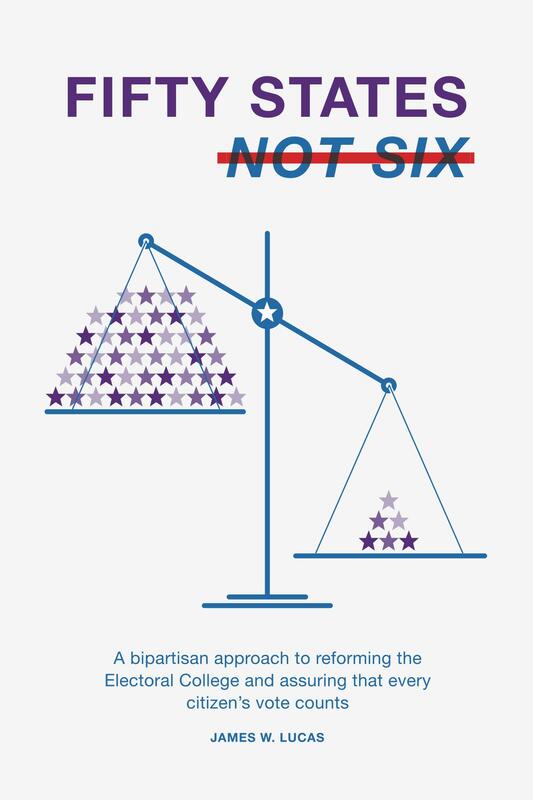 My new short book Fifty States, Not Six – a bipartisan approach to reforming the Electoral College and assuring that every citizen’s vote counts proposes a constitutional amendment which attempts to comprehensively address all of these issues. The Popular Electoral Vote Amendment reforms rather than scraps the Electoral College system, preserving its unifying function while assuring that every citizen’s vote counts by eliminating winner-takes-all. It also equalizes the votes of all citizens in congressional as well as presidential elections by apportioning based on the citizen population. This short but comprehensive look at our election system offers fascinating historical insights from the founding to the 2016 election, as well as looking forward to reforming that system so that every citizen’s vote counts. It also shows how this proposal is in the partisan political interests of both Democrats and Republicans. The book is now available in print for only $5.99 from Amazon and for download for only $2.99 on Kindle or Nook.